In this detail of a TS of a cross-section cut about 10 mm from the tip of a small taproot, you can see one of the two xylem poles and its associated resin duct (RD). The endodermis and pericycle are both thin-walled and indistinct. 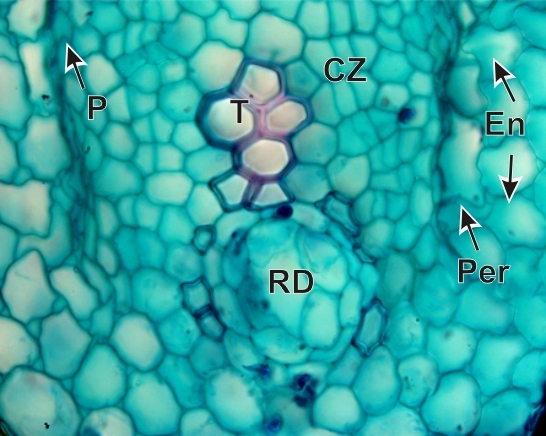 Some of the thin phloem elements beneath the pericycle are crushed, possibly during sectioning. Protoxylem tracheids are closet to the resin duct and the metaxylem tracheids are furthest away from it. The endodermal cells in this immature region, lack suberin. Gymnosperm tracheids are known to have low conductivity and high resistance to cavitation failure compared to vessels in angiosperm xylem.